Quick, Easy & Beautiful! | Just Create! Sometimes, when I am browsing my favorite blogs, Pinterest or Etsy, I come across some cool stuff I would love to be able to own. But, with me being a stay at home mom, money is tight – especially around Christmas. So, I do without. 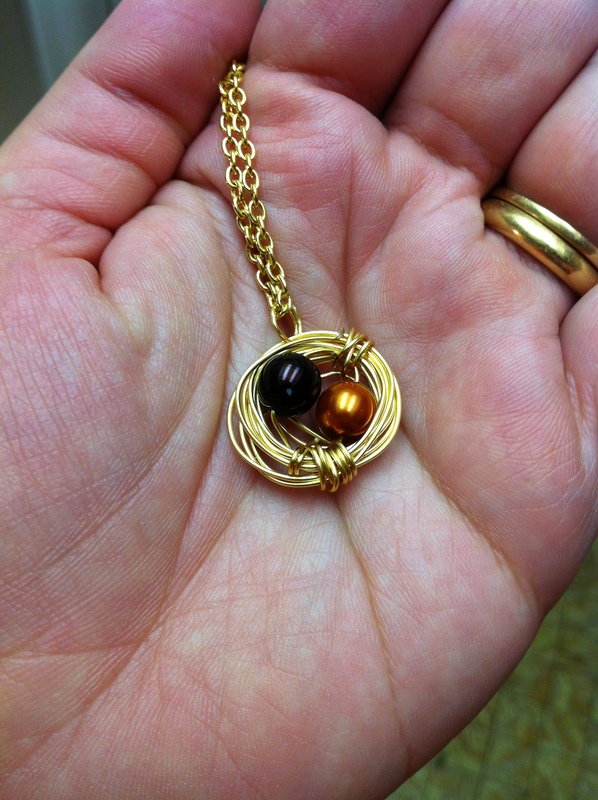 One of the things I immediately fell in love with were lovely little “bird’s nest” pendants. They had beads or pearls in the middle of a wire bird’s nest. They are usually sold for mothers, with the number of beads equaling the number of kids a mom has. I would look at them for the longest time, longing for one of my own. And then I found this post on Pinterest! I was so darn excited and had to run to Michael’s right away! And then remembered I didn’t get jump rings and had to go back! LOL! The hardest part of this project was picking the perfect beads. I thought about pink and blue (for my kids) but I don’t wear pastels. I searched and searched, until I came across an assortment from Michael’s, simply called Autumn. They were perfect!! I ended up using 22 gauge gold wire since it was all I could find. I had the tools and have worked with jewelry making before so didn’t need to buy anything beyond the basic supplies, but you definitely need a wire cutter at least to make these. I strung two beads of my choosing and proceeded to have a sweet little nest made in just minutes. I added a jump ring, put it on a gold chain (purchased at Michael’s) and added a clasp. I will say my clasp is too big for my liking, but that is easy enough to correct. After all was said and done, I am THRILLED with what I have! See??? I wore it today for the first time and LOVE it! It is so lightweight I can barely tell I have it on! And I think it cost me under $10 to make it, too! Beats paying $15 – $20 and not getting to personalize it exactly the way I want! I highly recommend trying this one yourself! It’s a great intro to jewelry making! That is gorgeous! I’ve seen them too. Really nice.